For Nick's 9th birthday (I know I still haven't written his letter. Or Amelia's. Posts are stacking up like firewood over here. ), he asked to take our family and two of his friends to AirWalk. All he wanted was an evening at AirWalk and one of our friend Vickie's cakes, which was great. Only, one of his friends wasn't allowed to come to AirWalk because his parents had read some scary articles about the trampolines, ambulances, orthopedists, broken bones, surgery, casts, blah blah blah. So it ended up being the six of us plus Drake. I've read the same articles that Nick's friend's mom did, and I can understand why she said he couldn't come. I mean, there are risks involved with playing at this kind of facility. But this was our third or fourth visit, and I can honestly say that we haven't seen any overtly dangerous behavior on any of our visits. The referees do their jobs well, the kids obey the rules, and we haven't seen any injuries. We'll be going back, is what I'm saying. But I did tell the kid's mom, "Because of your abundance of caution, this will probably be the night we end up with a concussion or a brain bleed. PLEASE DON'T JINX US." We bought a two-hour "flight," as their playtimes are called; a standard flight is 60 minutes. Amelia was excited to get started ... she's that blurry yellow thing in the air. 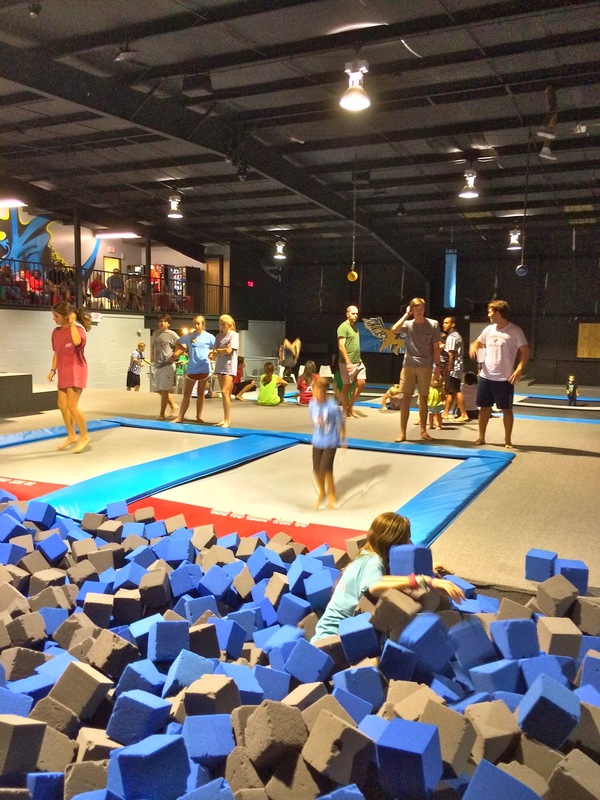 She chose a square of trampoline near the front of the large room and stayed there the majority of the night ... the bigger kids running back and forth didn't faze her one bit. Adults would run right across her square and she'd just keep right on jumping. 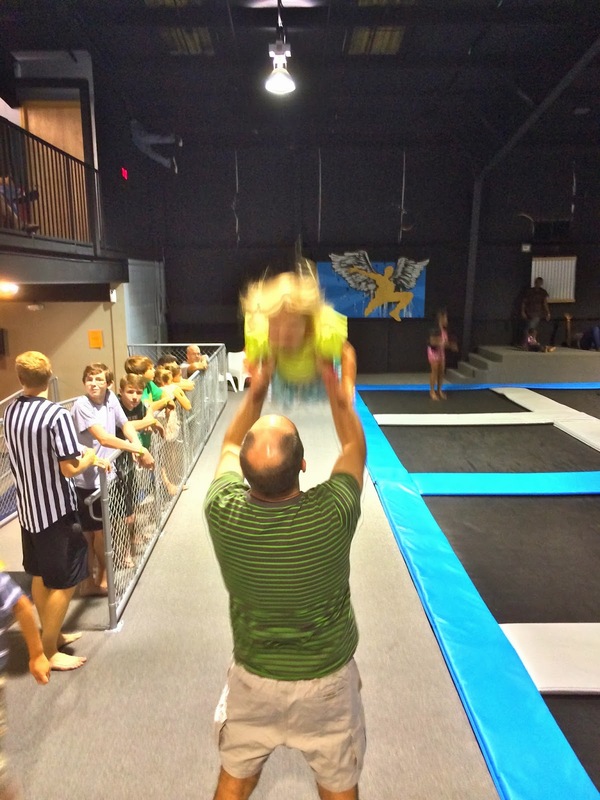 Nick gets more comfortable with trying complex jumps into the foam pit every time we go. I like the foam pit ... it's about eight feet deep and very dense, so I don't worry about Nick trying his crazy stunts over there. He does lots of flips and twists. You'd be able to see them more clearly if I used something other than my phone. Sorry. 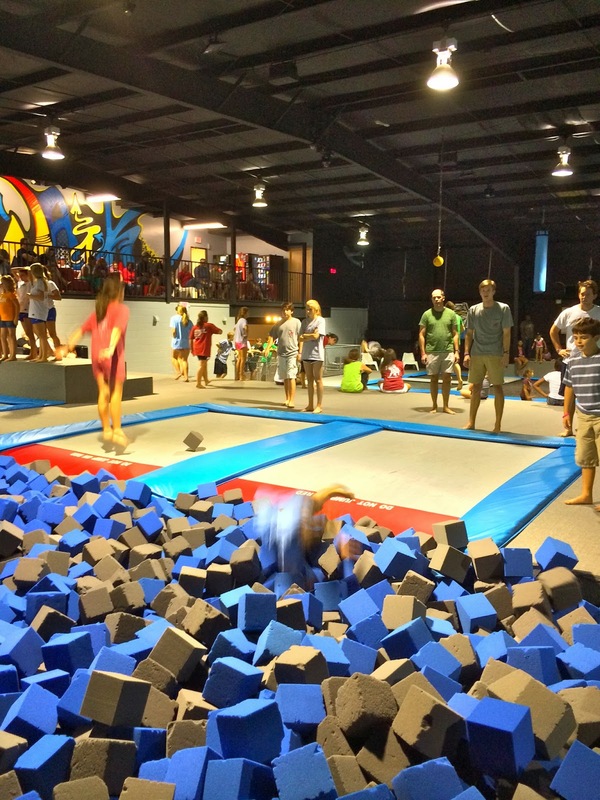 Drake, who'd never been to AirWalk before, wanted to spend all night in the dodgeball court. At some point Grayson and the boys decided to join in. And of course Amelia followed them all right in as if she belonged there. I'm telling you, she's not deterred ONE IOTA by Big People. She looks around at all those big kids and adults throwing balls at each other at top speed, and her inner voice says, "Well, I'll fit in jus' fine in here." So of course I had to drag her out, which led to a tantrum of epic proportions. I counted at least two mothers actively judging me as I tried to navigate its tricky waters. But then she was DONE. So I loaded her up and took her home, and Grayson stuck out the remaining 40 minutes or so with the boys. After I put Amelia to bed, I pulled out the Minecraft birthday cake that Vickie had made ... another one of her masterpieces! It was strawberry cake with buttercream icing, and it was amazing, as usual. I had it ready and waiting when they got home from AirWalk. Just before we cut the cake, Nick opened his gifts ... Drake was so excited for him to open the Nerf gun he'd brought. Our nephews and niece Grant, Will and Abby sent personalized birthday drawings, which Nick loved. After he opened his gifts, it was time to sing Happy Birthday and cut the cake! He was really happy with his day, and so was I. I think there's a lot of pressure on families these days to pull together big parties that are "Pinterest-worthy." If I had the time on my hands, maybe I'd do more of that. But I just don't. I have to focus on doing the best I can with the time I have, and for Amelia and Nick, that meant doing small parties with no decorations, focusing on the people AND THE CAKES. I refuse to feel shame in that. I highly, highly recommend resetting your own expectations to those of the average 9-year-old boy. Who has never laid eyes on Pinterest. I'd go so far as to say I believe that's the way God intended it.